NEW SERIAL TODAY! --- I'm sure for time travel if this is what's waiting. Harry A. 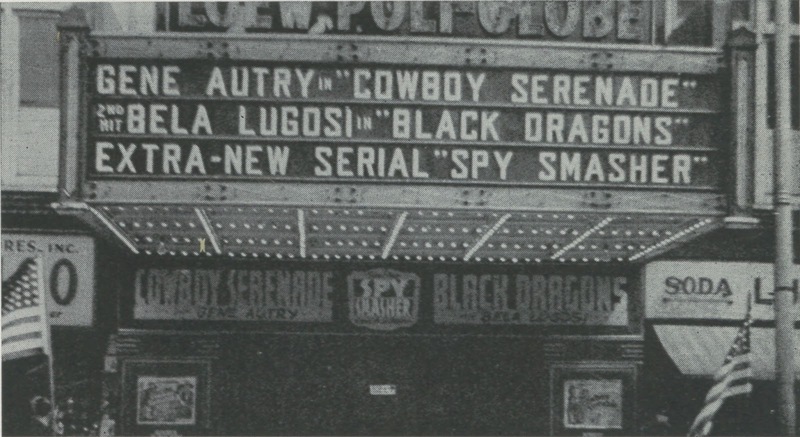 Rose, of Bridgeport's Loew's Poli Globe, gave starting serial Spy Smasher a marquee boost and reported he'd do the same for all advertising relative to the bill. It was essential to hook kids with a first chapter, bettering chance they'd keep coming till the last (in this case, twelve installments). Easy to forget what serials meant to a showgoing public then. The Liberty used to have two in progress at any given time, Wednesdays and Saturdays, refutation to belief that youth only went for chapter-plays. And what of ongoing myth that Bela Lugosi sunk in cheapies unworthy of him? Monogram and PRC kept him lots busier than Universal ever did, and I'll take Black Dragons over down-the-bill placement for BL in U's Night Monster and 1941's The Black Cat. Lugosi was a star at Monogram, and theirs deserve credit for putting him back at center stage. The company too had topical fruit on these vines, Black Dragon addressing Fifth Columns and the attack on Pearl, its release within three months of 12/7 infamy date. KEEP OLDIES FLYING --- Really liked this Hell's Angels trade ad done by Astor for a 1942 reissue. Nothing like a "New Streamlined" 1930 combat show to excite twelve-year-later crowds lately immersed in a new war. Safe to say it remained, as of '42, "The Greatest Air Film Of All Time" (had any topped it to that point? ), but aircraft in the ad mislead, being rather more modern that relics that flew against Huns in WWI (and what's this about the R.A.F.?). "Flaming Headlines" inspired by deeds dramatized in Hell's Angels might too have died down by 1942. Interesting is dearth of cast names, a Jean Harlow mention would have been tip-off as to H'sA deep library status. Bombs were again dropping on London in 1942, but not from zeppelins as in the Hughes pic, much of the oldie's charm deriving from that stand-out portion. Would the Hell's Angels color sequence have been in any of the Astor prints? Probably not. Assume it was shortened considerably too, but talk about evergreen. I'll bet independent exchanges still had prints into the late 60's. Wonder if Astor (or anyone) did 35mm safety for post-nitrate era bookings. 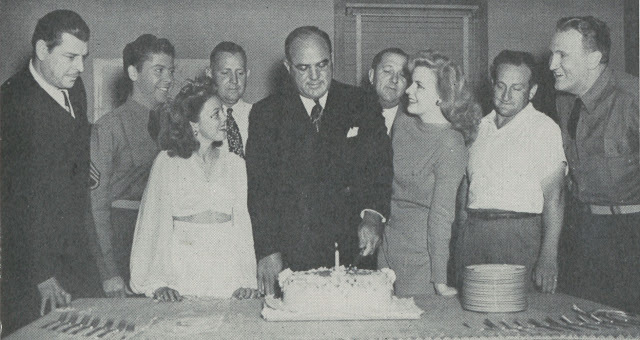 A STREAMLINER BIRTHDAY --- Here's an arresting group to celebrate the first anniversary (7-42) of Hal Roach streamliners. They are, left to right, Fred Guiol, William Tracy, Jean Porter, Sid Van Keuren, Roach cutting the cake, studio VP/general manager C.W. Thornton, Marjorie Woodworth, director Kurt Neuman, and Joe Sawyer. Further cause for cheer is recent completion of Fall In, another in a group of service comedies with Tracy and Sawyer. Streamliners were an interesting Roach idea that supplied forty or so minute support to wartime programs. Some were popular, like the Tracy-Sawyers, others less so. I like how Roach always looked for unconventional ways to grab his market share, streamliners a clever concept and made cheaply enough so none would amount to serious gamble. Many have turned up on TCM, and curiosity at least make all worth seeing. 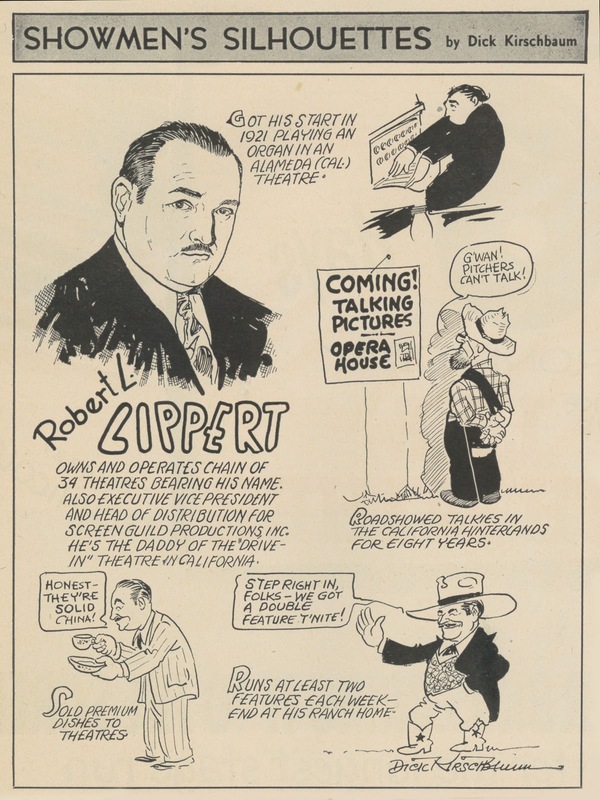 THE BOB LIPPERT STORY --- Hats off to a great showman that thrived from silent days all the way to a 60's brace of chilling that included faves Curse Of The Fly, Witchcraft, and The Earth Dies Screaming. This cartooned tribute ran, appropriately, in a 1947 Showmen's Trade Review, a mag where Bob and his works were often celebrated. Lippert knew best what we rubes liked: westerns, vaudeville revues, hillbilly hijinx --- he could throw a rope on any trend/genre for quick coin. Bob was also a friend and US host to nascent Hammer (then Exclusive) Films; his deal with them gave budget UK noirs valued exposure here. There was more pic lore in Lippert than any ten guys they've written books about. Imagine him spinning yarns at a Theatre Owner's convention over an eighteen ounce steak. Lots of history left with Lippert. VCI is the disc label that offers much from the RL library. B's all, but in many cases, good B's, and all entertaining. Samuel Fuller got a start with Bob. Three he directed are available from Criterion in a box. More about Lippert here, and further will hopefully come as trades are perused. NIX ON WAR FLIX --- Speaking of war, or not, here is Spring 1943 point of saturation for a conflict gone on beyond viewership's patience. I've seen numerous ads where theatres pledged no combat content, with nary mention of fighting still engaged around the world. '43 was a morning after to a just past year spent furiously flag-waving, and escape from the war came for many to mean escape from references to war. It Ain't Hay was Abbott and Costello out of uniform after hitches with army, navy, and air force. Handlers of the team knew by this time not to crab a popular act with continued service stops. As to the RKO Palace's "Not A Hint Of War In The Entire Show" pledge, I'm a little dubious. Wasn't Sherlock Holmes In Washington all about keeping secret microfilm out of Axis hands? Holmes' paean to US gov't effort and efficiency smacks of concern for the present emergency, and modern-day Washington setting makes the topic pretty unavoidable. 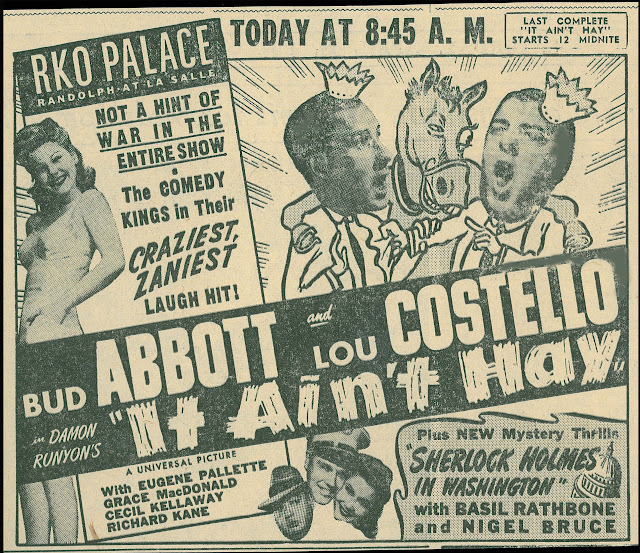 Still, this ad for Chicago's first run gives insight to how Universal's SH series was program-placed. Most urban openings I've come across have Holmes bringing up rear for A&C, Montez/Hall, or whatever "A" needed propping. Speaking of the Roach Streamliners, next month TCM is running his "That Nazty Spy," the semi-sequel to "The Devil with Hitler." I've never seen it, but I look forward to it the way others do "The Godfather II." Ironically "Sherlock Holmes In Washington" is the weakest of the Basil Rathbone/Nigel Bruce films. Modern Washington, D.C. was just not atmospheric enough for the Doyle characters. On the other hand "The Scarlet Claw" set in a remote French-Canadian village is the best in the series, with it's misty swamps resembling the English moors. Love the no-war-stuff blurb in the A&C ad! I like "Night Monster" too, Dave. I just regret they didn't use Lugosi more in it. Hell's Angels is greatly in need of a rousing music score. I would hire John Williams or some similar movie score composer. Clean it up, and re-release it in both Theaters and Blu-Ray. With the choice of new music or the original non-music score version.